Veszprém (German: Wesprim), located in the Bakony Woods, is known as the “city of Hungarian queens“. The name goes back to the Hungarian queen Gisela who, as documents show, brought the first German knights and clerics to the region. The first wave of German migrants came with the end of the Ottoman Rule. From the 1720s onwards, the number of German inhabitants grew steadily. Most of them were very welcome in the region, since they were skilled workers, among them carpenters, cabinet makers, wagon makers and butchers. The German settlers were also involved in the establishment of printing industry in the city. In 1789, the typographer József Streibig opened the first printing shop on today’s Óváros Square. The shop mostly printed documents in German and Latin. His successor also was a German emigrant. Veszprém’s county museum displays the history of Bakony, the Balaton Plateau and the city. Furthermore, it shows traditional folklore costume of the region. Veszprém Castle is a protected monument. 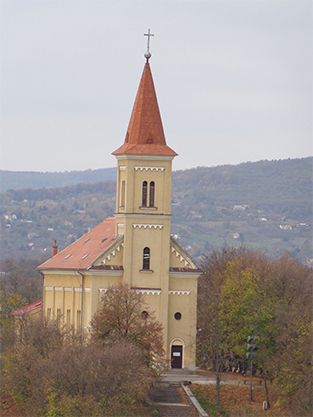 It was restored in the 18th century and is associated with Bishop Padányi Bíró Márton – called ‘church builder’ in der region. After the end of the Ottoman rule, he had commissioned the reconstruction works. The bishop palace within the castle is unique. Since 1993, it is the archbishop’s seat and since 1996 bears the relics of Gisela. 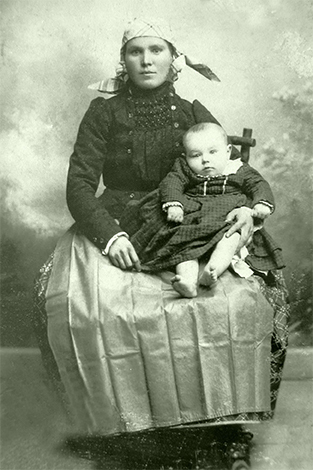 Woman and child in local costume.